The invalidity of treaties is a topic which is scarcely dealt with in legal literature and much the same is said of the separability of invalid treaty provisions. 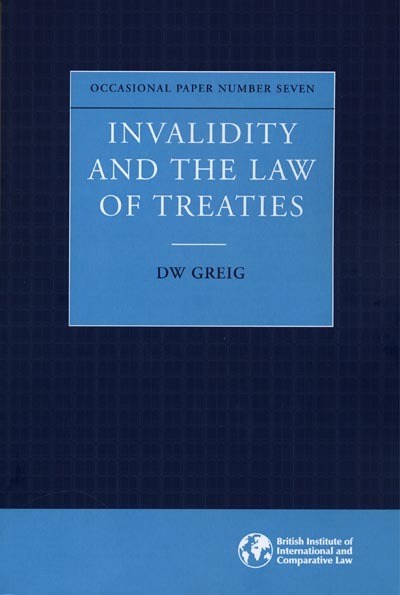 Don Greig's Invalidity and the Law of Treaties is designed to rectify this neglect. It deals with the consideration of the topics by the International law Commission and how the Commission failed to pick up the defects in its own recommendations, particularly with regard to the difficulty of applying separability to several of the invalidity provisions. It also includes a discussion of the powers of the Security Council as they might affect the validity of a treaty. "Invalidity and the Law of Treaties"